As March Madness slowly inches closer and closer, "Scouting the Contenders" takes a look at some of the nation's best teams in a chaotic race, and scouts their strengths and weaknesses and just how far they could go in the NCAA Tournament. We begin with the nation's current No. 1 team, the Tennessee Volunteers. Scouting Report: In just his fourth season on Rocky Top, former long-time Texas head coach Rick Barnes has built a winner. Tennessee has gone from floundering for years in the post-Bruce Pearl era to the favorite in the SEC, and their first No. 1 ranking in over a decade. What is impressive and unique about this particular Tennessee team is that they play a brand of basketball distinctively different than the way modern basketball is trending. The Volunteers lean on a physical offense that plays inside-out basketball, even with a solid crop of shooters on the roster. Tennessee shoots three-pointers roughly 24 percent of the time down the court, which comes in at 330th in the entire nation. This reliance on post play is understandable considering the configuration of the roster; UT has two of the better forwards in the SEC, if not the nation. Junior Grant Williams has been terrific all year, and looks like a serious contender for National Player of the Year. He's a polished, versatile forward that has been unstoppable at times, including dropping 43 points in an overtime victory over Vanderbilt. 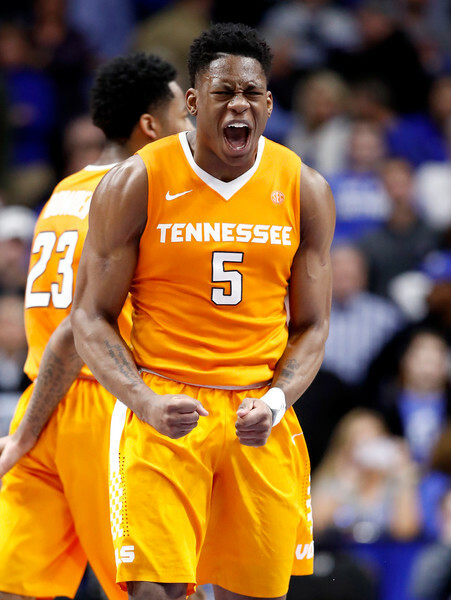 Admiral Schofield has also been a crucial piece to this team's success, and is a valuable No. 2 scorer. Schofield, a senior who has been instrumental in the Volunteers' rise under Barnes, continues to expand his game. He's always been effective getting inside and finishing through contact, but his improved three-point shooting is important for this offense. Add in a trio of guards, Jordan Bone, Lamonte Turner and Jordan Bowden, and you understand why this Tennessee offense is currently averaging 86 points a game, which is sixth in the country. Defensively, they aren't quite as strong, and have been forced to win a few shootouts. The big question mark for this defense will be stopping opponents beyond the arc, and forward Kyle Alexander playing smarter. Alexander has been prone to foul trouble, which has really hurt a team that doesn't have much size to begin with. And, the Volunteers don't defend the three-point line as well as they should, which could haunt them once they get deep into the NCAA Tournament. With that being said, there is still a ton to like about this Tennessee squad, and a reason they are the top team in the country. They are well-rounded on both sides of the ball, have depth up and down the roster and a lot of experience, crucial elements to any deep postseason run. They also have the motivation factor; after a tremendous run through the SEC a year ago, the Volunteers were one of many who fell victim to Loyola-Chicago's improbable Final Four run. They want to come out and prove that was a fluke and that they are truly one of the best in the country, as does Rick Barnes. Barnes is well-respected around the country for his ability to develop talent, but he hasn't gotten past the second round in the NCAA Tournament in over a decade, when he went to the Elite Eight in '08. The Verdict: Considering they currently sit atop the polls and have now for three weeks, it would be insane to call Tennessee "underrated". Yet, this still seems like the type of team that is going to get ignored by a lot of people when compared to Duke and Kentucky's talent or Virginia's suffocating defense. Personally, I'm incredibly high on this Volunteers team, and while it may be over a month until the start of the NCAA Tournament, think they'll go far. The big question this team is going to have to answer centers around the three-point line on both sides of the ball. They're going to face teams that have hot shooting nights, or teams that can make life difficult on offense. Can they keep up with very good shooting teams? Will they be able to defend beyond the arc well enough to keep up? These are valid concerns, but Tennessee has plenty of conference play action left to answer them, and give us more of an insight into what they can do. As it stands, I'm a firm believer in UT, and think they are one of the safest bets to go far in what should be an interesting NCAA Tournament.